← Did a security hacker take control of a commercial flight? This article is part two in a series of articles on EMF pollution. Part one on the background to EMF pollution is available here. We’ll now proceed with a detailed description of man-made sources of EMF (Electromagnetic Field), discuss past study results, and finish up with some suggestions for gauging your EMF exposure, and steps you can take to minimize it. Chronic diseases have many potential causes, including genetics, deficient diet, toxin exposure, and repressed emotional expression. 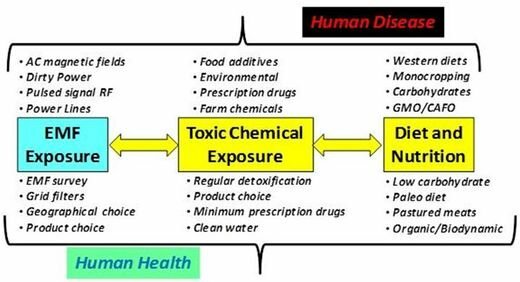 Research has mounted over the past two decades in support of adding EMF exposure to the top-level list of causes of chronic disease (including genome/DNA damage). It’s likely that a chronic disease condition results from a unique and individual combination of these top-level stressors, so EMF exposure should be considered in the context of other source causes, as suggested in Figure 1. 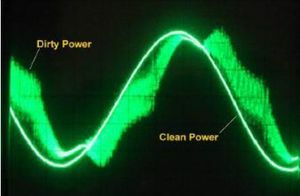 The primary man-made EMFs that have been identified are AC (alternating current) ELF (extra low frequency) electric/magnetic fields associated with power distribution, ‘dirty power’ (a negative by-product of our switch to ‘energy-efficient’ appliances, which produces ‘transients’ – electrical ‘spikes’ and ‘sags’) associated with high frequency noise induced in the power grid, and wireless RF (radio frequency) signals originating from a host communication systems – both commercial and military. Every year volumes of studies are published by researchers attempting to quantify the health risks associated with these man-made EMFs. After several decades of concerted study (and much money), the general public perception remains that little of substance has been proven linking EMF exposure with serious negative health consequences. A good part of the responsibility for this lies with the news media and their lack of motivation to inform the public of what these studies really show. Instead, the media plays a role more akin to concealing the truth and delivering lies – the kind we, collectively, prefer to hear. But there is a complicating factor that detracts from many of these studies. Suppose you are studying the health impacts of cell phone use. You find a cohort/control group consisting of people that have never had or used a cell phone (a tough job in itself these days). You are going to base the results of your study on the health of this cell-free group. But what if some members of this group are exposed to strong dirty power EMF in their home or work environment? The negative health consequences of one kind of EMF exposure (dirty power in this example) dilute the study results of another (cell phone use), making it very difficult to isolate and quantify effects. Throw in more unknowns associated with diet, lifestyle and toxin exposure, and we can see that the control and study groups may have to be very large in order to even detect an EMF signal in the data – let alone quantify the risk. So, in many of these studies, large uncertainties are built-in from the very start. That is a strong statement, but his data supports it. I have extracted some data from his paper and present it here in slightly different form in order to better summarize his results for this article. Figure 4 shows both the US cancer rate and percent electrification of residences from 1900 to 1960. The blue diamonds are the cancer rate in 5 year increments in deaths per 100,000 population, and the red squares show the corresponding percent electrification of all residences at the time. Both the diamonds and the squares (cancer rate and percent electrification) share the same left vertical scale. 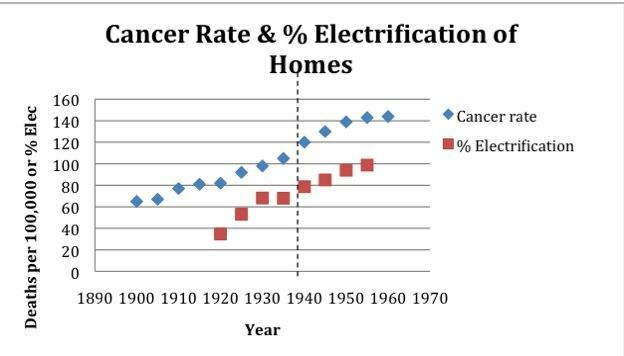 Notice that the peak in electrification reaches nearly 100% in 1956 and the peak in cancer rate is still rising after 1960. This lagging behavior is what you would expect from EMF-related cancer since many years of exposure are required. Keep in mind that over the time-frame in Figure 4, there were no cell phones, no WiFi, no digital communication signals of any kind. Analog TV only appeared at the end of this period. So power grid electrification was the only significant (man-made) EMF source. It would be impossible to generate or replicate this kind of data in today’s environment. Milham maintains that this correlation strongly suggests causation (see his paper2 for correlation statistics). He also maintains that the causative EMF is noise transients on the power grid (dirty power). I think it’s likely that in many homes/businesses, AC magnetic fields also played a role but the two factors are inseparable in this data. The dashed vertical line in Figure 4 passes through 1940 when 78% of all residences in the US were electrified. By demographics, these were mostly urban. That leaves 22% un-electrified – still a sizeable group of the rural population. Milham broke out the data by disease in 1940 by computing the excess urban deaths over and above the rural population in percent. His results are shown in Figure 5 for various diseases, all deaths, and motor vehicle deaths (for reference) that were recorded in the year 1940. These percent excess disease deaths for the electrified urbanite are very significant. Notice the excess percent deaths for diabetes is 65%! I wonder if this is related to known, measured blood glucose variations in response to short duration EMF exposure in some diabetics6. Suicide, diabetes, heart disease, and cancer have all – separately, in modern studies – been associated with long-term EMF exposure, and the only significant EMF in 1940 was electrification by the grid. Notice that the excess deaths due to motor vehicles is only about 1% – as one might expect. Excess deaths due to all causes was still elevated by 20%. This excess percent deaths in 1940 in Milham’s data shows the same strong correlation with electrification when no other significant EMF is present. And that would lead to underestimated risk in all subsequent studies. This has, no doubt, played a role in the understated message the public receives regarding the risks of high tech EMF. It should be noted that Milham does not discuss the likelihood that urban diets (in this time frame) were deficient compared with the rural counterpart, and that this could be a confounding factor in his results. However, the chances that diet alone explains the urban/rural death rate differences in 1940 seems remote. Let’s back up for a second and take a closer look at ‘dirty power’, or ‘dirty electricity’. Figure 6 shows oscilloscope traces of two 60Hz AC waveforms; one appearing to be a clean sine wave – the other is a very noisy version with a high frequency hash blurring the otherwise smooth 60Hz wave. The two traces are slightly offset so that both can be seen. The high frequency hash is due to voltage/current transients induced on the grid when the grid energy is rapidly switched on and off to achieve variable input power to some device, motor, or appliance. This rapid switching causes transients at the switch rate and noise harmonics up and down the frequency spectrum. This noise is induced on the 60/50Hz grid and appears at every socket in the home (and your neighbor’s home). Most of this noise is contained in the 1-140KHz band. Most modern appliances make use of switching power supplies to provide us with variable speed options for convenience (and advertising purposes). What is not so well known is that these modern devices can make a dirty mess out of our grid system. The more current draw the device demands, the more noise it will produce when the input power is switched. In today’s variable speed devices, this switching is accomplished digitally. Decades ago this was not an option and variable speed (in a motor for example) was accomplished via a mechanical switch between taps on a transformer – the point being that our older appliances were much safer and cleaner with respect to dirty power. Figure 6 Offset oscilloscope traces of clean 60Hz AC and one distorted by induced high frequency noise. Dirty power also arises from any electronic device that requires AC-DC conversion from the grid. This is because the conversion process requires that the AC be rectified (no negative voltage swings), which induces transients and harmonics similar to switched power supplies. The more power the device demands, the higher the induced noise. This is why cell phone base towers produce so much dirty power on the grid – they require massive amounts of DC power for the digital electronics (digital signal processors) that support the cellular phone system. In fact, Milham maintains that the real threat from cell towers is the dirty power they induce on the grid in homes in the vicinity of the tower. So, all those transformers that we plug into sockets to power various electronic boxes put noise on the grid even if the electronic device is turned off or not plugged in (these transformers are also a significant source of AC magnetic fields while they are plugged into a socket). How does dirty power affect our health? This noise in your wiring and at your sockets does not radiate (couple) to free space in the same way that a cell phone antenna radiates the RF cell signal3 – the frequencies are very different (100KHz versus 900-1800MHz). The mechanism is referred to as capacitive coupling and involves objects in the home (including the human body) and their electrical relationship to ground. Capacitive coupling occurs through the electric field where charge (electrons) at one conductor (the electric wires or socket) acts on the charge on another conductor (your body) through a dielectric medium (the air). It can be looked at as if the electrical grid field is always ‘seeking’ a path to ground. For example, Figure 7 shows a trace from two EKG patches placed on the ankles of a man standing at his kitchen sink4. The time snapshot of the window is 250 millisec and the peak-to-peak voltage swing is about 18 millivolts. Both the noise and 60Hz components can be seen. It is estimated (by modeling) that 80% of the noise energy at frequencies below 1KHz is dissipated in the skin and 20% is dissipated internally; and at frequencies above 2KHz, all the energy is dissipated internally5, 6. This indicates that long-term exposure potential for EMF damage is much greater for the higher frequency components of the dirty power noise. This may be consistent with the masking of the natural EMF discussed in Part 1 of this article. It may also have to do with disturbance of sensitive electro-chemical metabolic functions and signaling at the sub-cellular level. Even without grounding, the effect can vary depending on geometry and proximity of large metal objects (such as refrigerators, stoves, metal ducting, etc). Notice also in Figure 7 that the high frequency components of the noise (evident in Figure 6) are absent – apparently absorbed in the test subject’s body. Some people have responded to the problem of dirty power EMF by embracing an off-grid lifestyle. Others have installed Graham-Stetzer (GS)7 or Greenwave filters8 in their home sockets to attempt to reduce this noise to acceptable levels. The efficacy of these filters has raised some controversy, however. For example, see this Health Canada report, and a response from Magda Havas. But more on that later, when we discuss all the things you can do to protect yourself from the sources of EMF. For any teacher at this school assigned to one of the classrooms in which the GS meter hit maximum scale (>2000 GS units), her/his cancer risk increased 26% per year of employment! The observed to expected risk ratio (O/E) in the above quote is simply the number of observed cancers in the group of teachers divided by the number of expected cancer cases (in the general population or control group). The P-value is the probability of obtaining a test statistic (by chance) at least as extreme as the one that was actually observed – the lower the P-value, the less likely the result is a chance occurrence, and the stronger the correlation with the measured EMF (in GS units). This study (and its results) are unique in that the EMF levels were so high as to swamp out any noise due to control group EMF exposure and other (unknown) exposure factors (diet, toxins, etc)! In all likelihood, the single-source risk of dirty power EMF exposure is much higher than that found in the study. At these levels of dirty power EMF, everyone should be included in the category of ‘electrosensitive’. Another EMF associated with power lines and the power grid is AC magnetic fields. To understand the origin of these fields, we need a little basic physics. Figure 8 shows an AC power distribution system from power plant to home user. Figure 8 The AC power system consists of high voltage lines that are stepped down in voltage via transformers as they approach the end home user. The current (i) that passes out from the power plant is always the same as the current that returns. This is true throughout the system since it is a closed circuit. A voltage drop occurs at the load (home), indicating that power is being consumed (P=v*i). The ‘hot’ line is associated with the input voltage + . The ‘neutral’ line is at the voltage – . The current i in these lines is the same, but the voltage is very different. By the time these are transformed back up to the high voltage power lines, this difference between the ‘hot’ and ‘neutral’ wires can be hundreds of thousands of volts. This is why high voltage power lines suspend the wires so far apart; if they didn’t, this voltage difference would ionize the air between them causing an arc short between the lines. But there is a price to pay for separating these lines – AC magnetic fields. Figure 9 shows a current on a long straight wire and the resulting magnetic field that will always accompany the current. of the current(i) – the curl of the rest of your fingers shows the flow of the magnetic field. Now picture two closely spaced wires that feed a load in closed circuit like the one in Figure 8. The current (i) in the two wires is equal and in opposite direction, and, since they are very close together, the magnetic field from one wire cancels the other, so no AC magnetic field will be measured in the space around the wires. 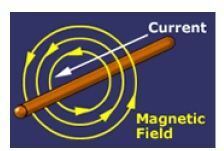 This is why there is a very large AC magnetic field under high voltage power lines – the wires are widely spaced (due to the high voltage) and the magnetic fields do not cancel. The AC electric field (volts per meter) is high due to the high voltage suspended over ground. Take another look at the banner graphic at the start of this article. 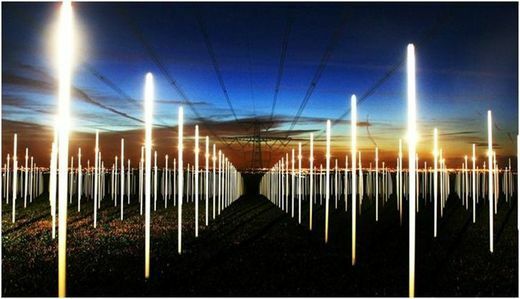 The photo shows an array of fluorescent lights mounted vertically – one end in the ground – under a high voltage power line in the UK10. This is a real photograph showing the whole array of tubes lit up simply due to the high voltage induced across the end of the tubes. Intuition would suggest that this is not a healthy environment for any animal. Getting back to the magnetic field, the wire pairs for each home circuit can be run together because the voltage has been stepped down to 120/240V. As long as the wires remain together, there is no net current, and therefore no AC magnetic field. The US National Electric Code (NEC – or your country’s equivalent) is very carefully crafted to eliminate net current in all buildings. This is aptly demonstrated by Karl Riley in his book,Tracing EMFs in Building Wiring and Grounding11, in which he describes common wiring errors that can lead to unacceptable AC magnetic fields in the home/office building. Electricians, just like everyone else, take shortcuts and make mistakes, but in the case of net current, they rarely consider the consequences of the resulting AC magnetic fields on the health of people in the environment – especially children. The majority of NEC inspectors are probably unaware of this as well, and the mistakes are rarely spotted. This is tragic because a simple gauss meter (which measures the magnetic field) and ammeter (which measures net current) can reveal the problem quickly before the wiring is encased in the building’s internal structure. Fixing these problems after the fact can be difficult and costly – and you may need a Karl Riley to diagnose, locate, and correct the problem. You can quickly determine if you have a problem with a cheap $40 gauss meter, but more on that later. When the pair of wires begins to separate, AC magnetic fields develop in the vicinity. All wire pairs must separate widely at the panel box for connection to grid power. This makes the panel box a strong source of AC magnetic fields and explains why you do not want any living areas adjacent to or in the vicinity of the panel box. The wires must also separate at each socket, light fixture, and appliance in the home/office. In the case of appliances, the wires separate internal to the appliance in order to power circuit boards, transformers, heating elements, etc. The more current and separation of the wires, the higher the magnetic field. Today it is generally and widely accepted that long-term exposure to AC magnetic fields in the range of 3-4 milligauss (0.3-0.4 mT) results in a doubling of the risk for childhood leukemia. It is, therefore, suggested that long-term exposure not exceed 2mG (0.2mT). Many scientists and health organizations suggest that a wider safety margin be applied, reducing this to 0.5-1.0mG (0.05-0.1mT). A healthy safety margin makes sense since there will undoubtedly be periods of much higher exposure, and the dose should be considered cumulative – much like ionizing radiation (radioactivity). “The next case is unusual in that it involves a child who developed leukemia in the first year of his life. I was called in to measure the magnetic fields in his crib room since it was next to the service entrance [panel box] closet in a large Los Angeles estate. I found no unusual field level emanating from the service closet itself, since the equipment was not mounted adjacent to the wall to the child’s room, but a substantial magnetic field was coming from an under-floor source which angled out from the service closet location, ran under the crib and exited near the corner of the room. The field at the crib was 4mG and on the floor where the child crawled it was 12mG [1.2mT]. These values were measured during the day when the only loads were the washer and/or dryer. During the evening the field levels would have been much higher. The field was due to a net current on the service lateral [circuit] which ran under the floor. I clamped the ammeter around the copper water supply pipe where it entered the building and found it was carrying amperage. Following my recommendation the owner had a plumber insert a dielectric [insulator] coupling in the water pipe down near the water meter near the curb, which was about 100′ from the house. This took the neutral current off the pipe and restored it to the neutral conductor in the service lateral and balanced the magnetic field, thus reducing the magnetic field in the crib room to tenths [of an mG]. “I was called in by a family living in a desert community north of Barstow, California, who had experienced a sudden onset of electrosensitivity [ES]. They were sure something was wrong with the house as they could feel burning sensations, etc and had rashes on their hands which puzzled their doctor. A child born while they lived in the house was born with three kinds of brain damage. As this was the first case of electrical hypersensitivity I had come in contact with I was cautious if not a little skeptical. But when I measured the house with the lights on I found elevated fields in the master bedroom, the baby’s bedroom, and a field of 82mG at the couch the family gathered together on to watch TV. After a couple of hours of tracing I found the point where GCs [neutrals] of two circuits had been connected [together]. As mentioned in the text, it was at a duplex receptacle in the master bedroom where one circuit was controlled by a wall switch and the other was always energized. In such receptacles one must break off the tabs connecting the two parts of the receptacle – both the hot tab and the neutral tab. In this case only the hot tab had been broken off. As soon as the receptacle was disconnected the field dropped from 82mG one foot from the wall to below a tenth of a mG at the couch. An 82mG field one foot from the wall is generated by a net current of approximately 12 amps; in this case due mainly to an electric heater used by the family in winter. The footprint of induced ES is very evident in this account. The effect seems very similar to what gluten does to the Celiac sufferer, and makes one wonder: what are these EMFs are doing to the rest of us? To answer that question with any degree of confidence, we may have to factor in toxin exposure and diet – but more on that later. Figure 10 shows a tragedy unfolding in June of 2008 with the construction of a residential neighborhood directly under a high-voltage power line. The health risks associated with this kind of exposure are well-known, yet this construction practice continues as if local and national authorities are completely unaware of the risks. These homes sell well to consumers, which simply means that the general public remains uninformed as to the health risks of EMF in its major manifestations. Our media, scientific community and governments are doing a dismal job of protecting public health. Glance back at that banner picture at the beginning of this article – would you choose to live in one of these homes? These residents might be able to light the interior of their homes with upright standing arrays of fluorescent tubes. “Recent epidemiological studies have reported an increased risk of leukaemia in adults and children near overhead high voltage powerlines at distances beyond the measured range of the direct electric and magnetic fields. Corona ions are emitted by powerlines, forming a plume that is carried away from the line by the wind. The plume generates random disturbances in the atmospheric electric field of tens to a few hundred V m-1 on time scales from seconds to minutes. Such disturbances can be seen up to several hundred metres from powerlines. It is hypothesised that these random disturbances result in the disruption of nocturnal melatonin synthesis and related circadian rhythms, in turn leading to increased risk of a number of adverse health effects including leukaemia. In support of the hypothesis it is noted that melatonin is highly protective of oxidative damage to the human haemopoietic system. A review of electric field studies provides evidence that (i) diurnal variation in the natural atmospheric electric field may itself act as a weak zeitgeber; (ii) melatonin disruption by electric fields occurs in rats; (iii) in humans, disturbances in circadian rhythms have been observed with artificial fields as low at 2.5 V m-1“. The high voltage lines will ionize some of the air particles, and when these waft over local neighborhoods, they cause variations in the electric field. Henshaw has done extensive field testing of this effect near power lines, and his theory explains why leukemia is still elevated so far away from the power lines. It may be that it is the variation of the electric field over time (as opposed to the absolute field value) that has such a marked effect on the biological system. Henshaw has also theorized that the ions can attach to other aerosols (pollution) and that these particles can then be taken into the lungs, with negative health effects. 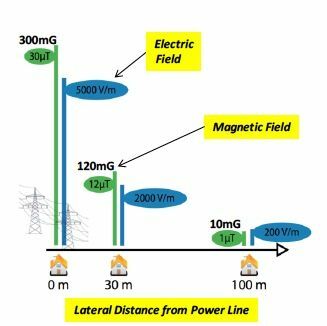 Epidemiology/statistical studies associated with high voltage power line EMF should be expected to show a significant footprint (against a range of symptoms) since the magnetic and electric fields are so high. Such a study was performed in 2008 in France, by the Centre de Recherche et d’Information Indépendantes sur les Rayonnements Electromagnétiques, along 250km of existing 400KV power lines14. 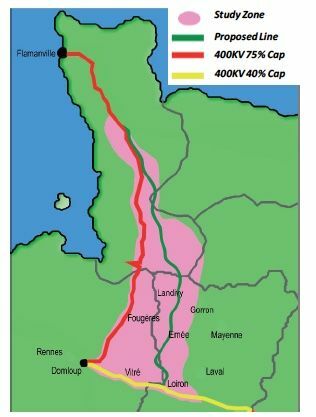 Figure 11 shows the study zone (pink) of the region in France, and three power line routes: 1) a proposed future 400KV line (green), 2) an existing 400KV line running at 75% average capacity (red), and 3) an existing 400KV line running at 40% average capacity (yellow). These three lines were chosen so that one would represent no exposure, a second would represent moderate exposure, and a third would represent high exposure. The zones of exposure for these existing lines were defined as 600 meters around the ground track of the lines (300 meters to either side). Figure 12 shows typical measured results for the electric and magnetic fields under the power lines, as a function of lateral offset. These values will vary depending on load conditions at the time of measurement. A total of 6,220 useable questionnaires associated with home, work, and farm environment (which took into account animal behavior) were used in the compilation of statistics. The data was compiled by power line zone to see if problems in animal behavior (on the farms) and human symptoms were correlated with power line EMF exposure. 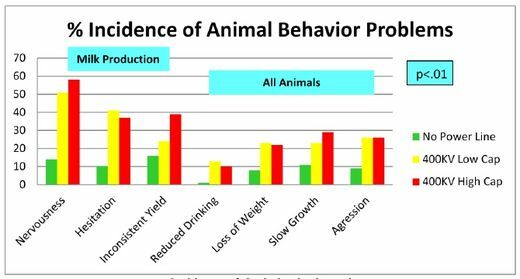 Figure 13 shows the results for animal behavior. Farmers reported serious divergence (from the norm) in behaviors of the animals within 300 meters of the power lines relative to the unexposed animals – up to 5 times the percent incidence. This incidence increase is clearly dominated by the high capacity exposure, but the low capacity exposure shows extreme deviation as well. Figure 14 shows the same percent incidence in each exposure group for a range of negative human symptoms. Here we see the same trend – peak incidence occurs in the high capacity exposure group and is still significantly elevated in the low capacity group. Note that psychological depression is reported at nearly twice the incidence for high capacity power line exposure relative to the exposure-free group. Many of these symptoms are associated with ES as well as acute exposure in non-ES individuals. But the percent incidence increase over the unexposed group is not nearly as large as that in the animal groups. Henshaw15 has suggested that the high frequency noise associated with dirty power may also act detrimentally through the AC magnetic field even though the field strength may be quite small (very little net current). He suggests that it is the pulsed nature of the transients acting through even a weak AC magnetic field that produces biological effects when exposure is chronic. This is partially based on findings that a patterned (pulsed) magnetic field causes cellular anomalies at levels as low as 0.9mG (.09 mT)16. Henshaw has also referenced epidemiology studies17, 18 that show increased odds ratio for miscarriage when the environmental magnetic field is characterized according to its pulse amplitude as opposed to the time-weighted average. Again, we see that it is the high frequency components of the noise associated with grid power transients that appears to have the greatest biological effect. This is extremely important because it suggests that dirty power in conjunction with a net current problem may amplify the negative biological effects significantly over and above the effects of either in isolation. So, it is very important to characterize both the AC magnetic field (due to net current sources) as well as grid power noise – and reduce both as much as possible in the living environment. 2. Milham, Samuel, ‘Historical evidence that electrification caused the 20th century epidemic of ”diseases of civilization”‘, Medical Hypotheses 74 (2010) 337 – 345. 3. Radiation from a cell antenna is a transverse electromagnetic wave (TEM) propagating in free space. Both electric and magnetic field directions are orthogonal to the direction of propagation. Reactive EM coupling can involve a radial component to the field in the direction of propagation making it behave more as a sound or percussive wave phenomena (longitudinal wave propagation). 4. Havas M, Stetzer D. ‘Graham/Stetzer Filters Improve Power Quality in Homes and Schools, Reduce Blood Sugar Levels in Diabetics, Multiple Sclerosis Symptoms, and Headaches’, International Scientific Conference on Childhood Leukemia, London, 2004. 6. Reilly, J.P. 1992. Applied Bioelectricity: From Electrical Stimulation to Electropathology, Cambridge University Press. 7. Graham-Stetzer socket filters are designed by Professor Graham and David Stetzer and offered for sale by Stetzer Electric, seestetzerelectric.com for more information on the GS meters and filters. 9. Milham, S, Morgan, L, ‘A New Electromagnetic Exposure Metric: High Frequency Voltage Transients Associated With Increased Cancer Incidence in Teachers in a California School’, Am. J. Ind. Med. 2008. 10. Richard Box’s ‘FIELD’ (richardbox.com), February 2004 Photo: Stuart Bunce. 11. Riley, Karl, Tracing EMFs in Building Wiring And Grounding – A practical guide for reducing magnetic fields due to wiring errors as well as current grounding practices, 2nd Edition 2007 by ELF Magnetic Surveys. 14 Gouhier, Catherine, Le Ruz, Pierre, ‘Citizen’s Survey, Living with a Very High Voltage Power line?’, Centre de Recherche et d’Information Indépendantes sur les Rayonnements Electromagnétiques 2009 (see this [PDF]). 15 Ainsbury EA, Henshaw DL. 2006. ‘Observations on the relationship between magnetic field characteristics and exposure conditions’. Phys Med Biol 51:6113 – 6123. 17 Lee, GM. et al. Epidemiology. 2002; 13: 21-31. 18 Li, D. et al. Epidemiology. 2002; 13: 9-20.